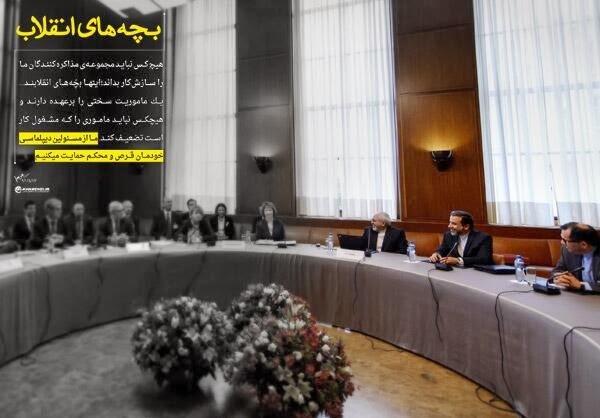 The supreme leader’s strong support of the negotiating team and calling them the “children of revolution,” clearly is an attempt to prepare the public for an emerging nuclear deal with the West. 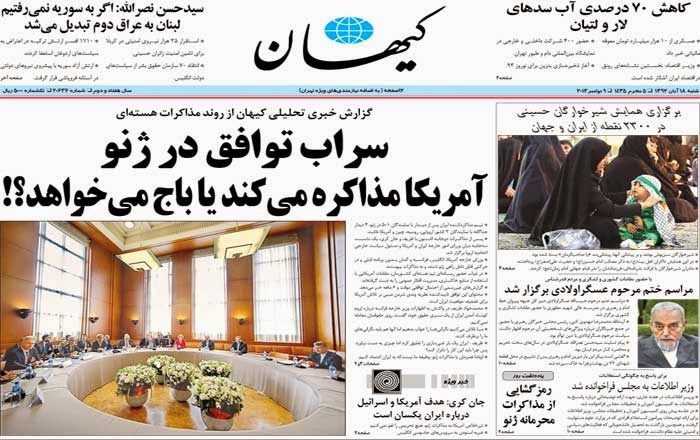 The bottom two photos capture the front page of today’s editions of Sharq and Kayhan, the influential moderate and hardline newspapers respectively. 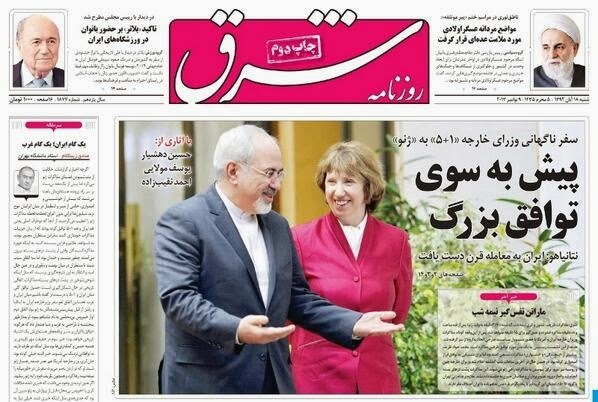 Their banner headlines on today’s Geneva talks manifest the political divide in Iran. SL branch of IRIG has countenanced negotiation so many times in the past, this latest position should in no way be considered extraordinary. Fingers crossed the U.S. position is no longer fixed on diktat and for the first time provided with flexibility. thw world's position IS clear. there'll be no heavy water reactor and stockpiling of plutonium. There is a possibility, that a demise of the Zionism will happen first, before any consideration of the Islamic Republic's fall. The Islamic Republic doesn't need a nuclear weapons, because it has strong believes and is right on her side. Iran is a victim and the victim has no need to apologize against perpetrators. it's not much of a possibility that Zionism will collapse before the Iranian theocracy is wiped and flushed. Indeed the occupying dirty theocracy will collapse in Iran before anything else that might arise in the middle east. zionism, like apartheid in South Africa, will inevitably collapse. The regime must not be allowed to even have a fire cracker in its armoury. No it wont because unlike South Afrika where the majority are blacks the majority in Israel are of Jewish origin. It is only your wishfull thinking that has brought you to these pages. Like South Africa used to, the zionist regime will collapse because it too, practices apartheid. Doesn't the islamic fascist dictatorship practice aparthied against the women of Iran? Even religious minorities in Iran are under aparthied conditions. Maybe your wishfull thinking ways have confused your judgement on the true scale of forced aparthied in Iran? I suggest you take off your rose tinted spectacles as soon as possible. Discrimination against women is not apartheid. Educate yourself about apartheid, before demonstrating your ignorance here. Anon 5:21 AM......Apartheid is just another word for discrimination. Maybe you should educate yourself first about the realities in Iran as regards religious minorities and women under the islamic mafia theocracy before accusing others of "ignorance". Wrong again, hasbara shill. Apartheid is a policy or system of segregation or discrimination on grounds of race. Something that Iran does not have but the zionist occupation does.